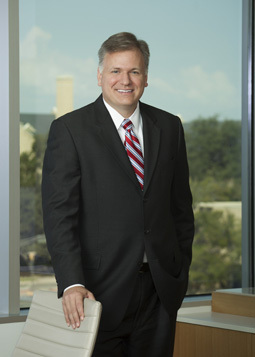 Douglas Clayton is Chairman of the firm’s Business, Tax and Estates Section. His practice focuses on mergers and acquisitions, corporate finance, securities offerings, SEC compliance, and other business transactions. Represented acquirer of commercial business park in North Texas in connection with a $340,000,000 purchase/leaseback transaction. Represented a national banking institution in its capacity as representative agent and lead arranger in connection with a $60,000,000 secured loan facility to be used by the borrower to support an acquisition strategy. Represented a real estate developer in connection with a $110,000,000 secured financing facility for the construction of a 100,000 square foot amphitheater and performance hall and related structures. Represented a foreign bank in its capacity as agent and lender in connection with multiple credit facilities in the aggregate amount of over $400,000,000 to a multi-national institution borrower and its foreign subsidiary to complete acquisitions of stock in multi-national entities. Represented a private oil and gas company in the negotiation of a $25 million line-of-credit facility. Represented a private financial services firm in the negotiation of a $75 million senior secured credit facility and a $51 million subordinated debt facility. Represented a private media company in the negotiation of a $140 million senior secured credit facility and a $17 million subordinated debt facility. Represented a publicly traded oil and gas company in the acquisition of oil and gas interests held by a private oil and gas company. Represented a private flight simulation company in a merger with another private flight simulation company. Represented a publicly traded oil and gas company in the issuance of convertible debt by means of a private investment in public equity (PIPE) transaction. Represented a private equity fund in an investment in a retail food company. Represented a private equity fund in the acquisition of the assets of a private pawnshop. Represented a publicly traded retail company in the sale of common stock by its affiliates by means of a private investment in public equity (PIPE) transaction. Represented a private media company in the issuance of preferred and common equity and the issuance or senior and subordinated debt. Represented a private right-of-way acquisition company in the sale of its assets to a private engineering firm. Represented a publicly traded oil and gas company in a public offering of common stock. Represented a non-profit corporation in a loan transaction to finance the construction of a charter school funded by a tax free municipal loan through a conduit cultural educational facilities finance corporation. Represented a non-profit corporation in the acquisition of the assets of a private manufacturing company. Represented a publicly traded oil and gas company in the implementation of a shareholder rights plan (poison pill). Assisted in the capitalization and formation of a state chartered bank, including a private offering of common stock, chartering with state and federal regulatory authorities, and the formation of a bank holding company. Licensed to practice law in Texas, 1998. Director, Junior Achievement of the Chisholm Trail, Inc.
What’s in a Name (of a Texas Company)? “Frequently negotiated deal terms in M&A transactions”, published in The Fort Worth Business Press, March 2019. “For-Profit Corporation vs. Nonprofit Corporation vs. Social Purpose Corporation vs. Public Benefit Corporation” published in both the Dallas and Houston citybizlists, September 2018. “10 Things Every Business Owner Should Know Before Selling Their Business.” Fort Worth Business Press, January 28, 2008. Co-Authored “New Rule 144 Amendments Improve Businesses’ Access to Capital” Texas Lawyer, March 10, 2008. “The ABCs of Taking on a Business Partner” in the N.E.T. Business Resource, September/October, 2010 publication. “Raising Capital for the Future of Your Business” in the N.E.T Business Resource, January/February 2011 publication. “Structuring the Deal” presented to Seed Investing as a Team Sport conference at World’s Best Technology Innovation Showcase, March 21-23, 2011. “Texas Supreme Court ruling may surprise landlords” Fort Worth Business Press, July 29, 2011. “Acquiring Knowledge: Don’t let your M&A deal end up in the rough,” Dallas Business Journal, July 22-28, 2011. “JOBS Act Good News for Growing Businesses,” CityBizList, Dallas, April 26, 2012.